Truro City manager Steve Tully says he was pleased to see his side keep their momentum going after their 2-1 Southern Premier League win at Dunstable Town. 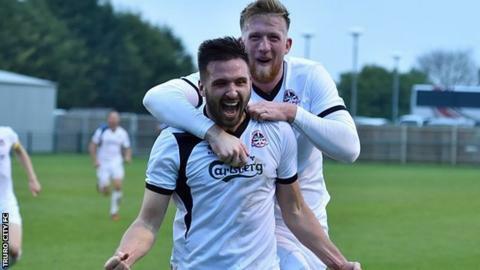 Matt Wright scored two first-half goals to send Truro to victory as they consolidated sixth place with a fifth successive victory. "We're on a good roll and we want to keep the momentum going," Tully told BBC Radio Cornwall. "There's good things happening at the club, we're in a good spell." Tully, whose team are outside the play-off places on goal difference, continued: "I said to the players after the game, you've got to keep that momentum, going. "This month we've played all the teams around us and we've sort of knocked them out of there now. "We're in a very good position, we're sitting where we want to be and we're not going to be very far away at the end of the season." Tully also made special mention of striker Wright, who had scored just once since his move from Bideford in October. "I'm delighted for him as he's worked his socks off since he's come to the club and he hasn't got the goals that he deserved. "Today he got two, and if anything he could have had three or four, so I'm delighted for him and we move forward."